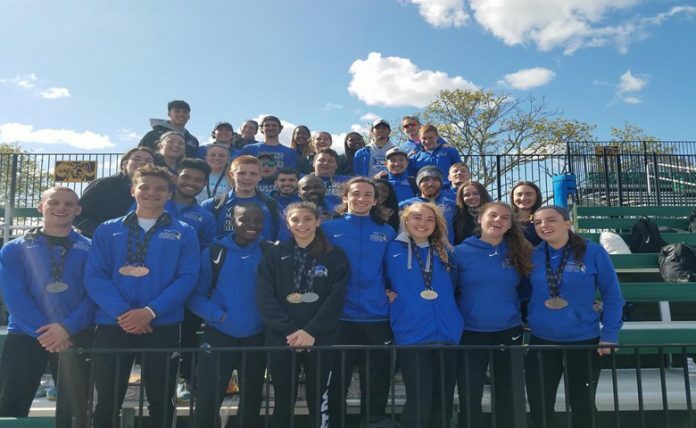 The Mount Saint Mary College Men’s and Women’s Track and Field teams excelled on Sunday at the inaugural Skyline Conference Outdoor Championship. FARMINGDALE – The Mount Saint Mary College Men’s and Women’s Track and Field teams excelled on Sunday at the inaugural Skyline Conference Outdoor Championship hosted by Farmingdale State. Four women claimed individual titles on the day, while a trio of men’s athletes set school records for the Knights. Mount Saint Mary received first place points in four women’s events on Sunday, highlighted by a first place run from Samantha Papadopoulos who posted a time of 17.38 seconds in the 100-meter hurdles. Zoe Jabs earned a first place finish in the steeplechase with a time of 13:12.07 for the Mount’s second win on the track. In the field events, Breanna Scott scored a win for the Mount in the javelin with a toss of 28.09 meters, while freshman Alexandra Salamone picked up first place points for the Knights in the Shot Put with a heave of 9.87 meters. Papadopoulos continued a strong day with a runner-up finish in the 400-meter hurdles, with Salamone earing second place points in the Discus with a personal best throw of 32.4 meters. Valerie Lupi took second in the Javelin with a throw of 24.06 meters, while Michelle Gildea picked up a runner-up finish in the 100-meter hurdles and a third place finish in the 400-meter hurdles. Victoria Laiso and Victoria Laurange also had strong showings for the Knights, with Laiso taking third place in the women’s high jump and Laurange claiming third in the 100-meter hurdles, closing out a sweep of the top three positions for the Knights in the event. “Samantha, Vicky, Michelle and Zoe were outstanding on the track today in their events. Val and Alex scored a bunch of points for us in the throws. I am so proud of every ones efforts, they gave it their all” said Head Coach Fred Callo. In the men’s meet, Sean Farrell posted a new school record in the pole vault with a jump of 3.2 meters and Isaiah Bevans-Didymus claimed runner-up points for the Mount in the 400-meter dash with a school record run of 51.34 seconds. Peter Zecchin also posted a new school mark for the Knights, recording a throw of 12.09 meters in the Shot Put. Mount Saint Mary also received strong showings on Sunday from Noah Ginty and Edward Arnold. Ginty tossed the javelin 40.44 meters, while Arnold finished third in both the High Jump and Long Jump. “For the men’s team Sean, Isaiah, Donte, Chris Grady, and Patrick Dempsey did a great job of helping us score points on the track today. Eddie Arnold, Peter and the all the men throwers did a great job of scoring points for the men’s team. They all had a great day for us, I could not ask for anything more” said Callo.